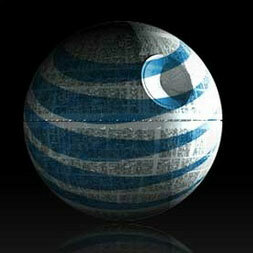 Apple Teams With AT&T For The iPad's 3G Connection. Ugh. Today, during the unveiling of the iPad, Apple CEO Steve Jobs announced that you’ll be able to get an iPad that has both Wi-Fi and 3G access, meaning you can download new content from nearly anywhere. That’s great news. The not-so-good? It’s powered by AT&T, which has been absolutely notorious for already being unable to cope with the 3G data usage of the iPhone. This sure isn’t going to help things. However, there are some upsides. For one, this internet access will not be based on a contract — you’ll sign up for the 3G access directly from the device, paying on a monthly basis. You’ll have two options for dataplans: a not-too-impressive 250 Megabytes for $15.00, or Unlimited downloads for $29.99 (though that will almost certainly have an unwritten cap as well). And you’ll be able to use AT&T’s Wi-Fi hotspots, free of charge. You’ll also be able to use these internationally — iPad 3G models will be unlocked, and will included GSM micro SIMS. It’s worth pointing out that most of what you’ll be doing with the iPad will consist of consuming content and surfing the web. Unlike the iPhone, where a dropped connection can result in cutting off an important phone call, a lost data connection on the iPad will probably just mean your website stops loading halfway. That said, the increased strain could make things even worse for iPhone users. Also note that while the iPad starts at $499, 3G models cost an extra $130, so the cheapest you’ll get is $629 for a 16GB model. More coverage can be found here.